Allegedly based on the work of a real cyber-psychologist (apparently they exist), Mary Aiken, Arquette's Avery Ryan heads the FBI's Cyber Crime Division. In Zuicker's CSI-world, complex International cases are opened and wrapped in forty-five minutes of frenetic key-board tapping, soldering, and DNA-swabbing. Admittedly there's less musical-montage pseudo-science B-S, as this is replaced by Mr Beek's running, jumping and shooting. 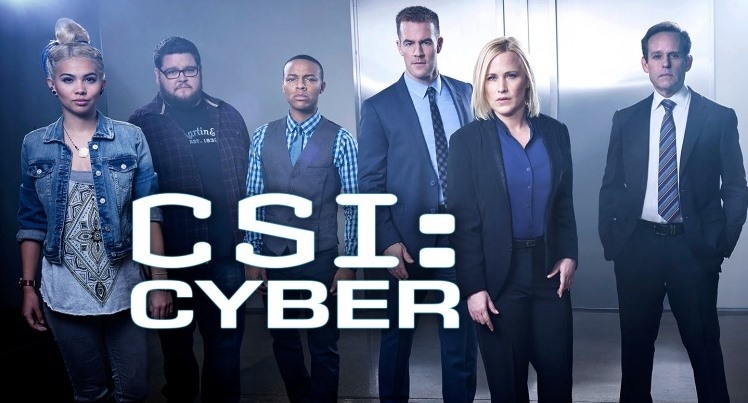 So in this respect, CSI Cyber is less CSI, more Hawaii 5-nil, whilst aiming for, and missing its target the original NCIS, or the whimsically fanciful Bones. Yes, the cast is less irritating than NCIS Los Angeles or NCIS New Orleans, but that's not difficult; the plots however are even more flimsy, with every cliche of cyber-nonsense wrapped around conventional cop-show tropes including team banter that makes the preceding CSI juggernauts look like Arthur Miller's finest. But what is really insulting is the sub-comic-book rendering of cyber-crime through the CSI magic-kit; microscopic fly-thorughs of screens, cables, circuit boards and computer code. This team can hack, crack and decrypt anything in thirty seconds. Apparently the FBI can conduct 3-D holographic autopsies straight out of Star Trek, so you don't have to waste time on any of those messy cadavers. Police procedural this ain't. It's like the FBI moved from Quantico to A Town Called Eureka. A wasted episode one concerned a baby kidnapping/auction ring, at once ludicrously high-tech, but run by monumentally stupid criminals. Episode two took us into proper cyber-terrorism, perpetrated by a disaster fetishist crashing roller coasters and subway trains. Like you do. So a representative cross-section of current cyber-crime then? Clearly neither were exciting enough and needed the angular but fit Mr Beek to do some running, jumping and shooting, with the obilgatory SWAT team to run about some more with big guns and riot gear. Indeed, this is a show so formulaic, you want to send it back down the conveyor belt on which it was assembled and ask for some better quality components. It sells itself as a thoroughbred Ferrari, but under the hood it's American pig-iron; a Corvette - noisy, fast, but shoddily put together and it can't hold the bends. Makes you wonder what they'll do when a Nigerian General asks them to accept a deposit of $10m in exchange for their bank details? Probably nuke Lagos. American TV is cranking out cop shpws like there's no tomorrow, from Rookie Blue to Chicago PD, shows with some grit and heft, to light-comedy flim-flam such as Castle. The trouble here is our two leads fail to convince as FBI agents - or leads. Medium was atrocious yet still ran forever and garnered awards (presumably for how much ad money it raised); but Arquette is no Simon Baker (Mentalist) or Dana Delaney (Body of Proof); certainly no Mark Harmon (NCIS). Beekie has charisma but I don't believe in him as an AmWay agent, much less FBI.